Elida’s KeShawn Spivey clears the bar in the high jump during Friday night’s Western Buckeye League Championships at Ottawa-Glandorf. Van Wert’s Abby Jackson competes in the shot put during Friday night’s Western Buckeye League Championships at Ottawa-Glandorf. OTTAWA — When you’re on top, everyone’s gunning for you. The Celina girls track-and-field program came into this week’s Western Buckeye League Championships at Ottawa-Glandorf, riding a six-year winning streak at the annual league meet. Van Wert pulled away in Day Two of the WBL Championships on Friday to capture its first girls league title since 1976. The WBL Championships started on Wednesday, with most finals Friday. Van Wert ended the meet with 99 points, while Elida finished second with 88 points. Celina (68) came in third, while Bath (63) was a close fourth in the 10-team field. On the boys’ side, Celina defended its 2017 WBL title, slipping past Elida, 112-103. Defiance (77) finished third, while Wapakoneta (61) came in fourth. “On the ladies end, we did what we could do,” Celina coach Eric Wagner said. “We scored more than what I originally thought we would. The senior leadership has been great this year. It was a great group of girls. We’re young on the girls end, but we’ll rebuild. The Van Wert girls not only got it done on the track Friday, but also scored big points Friday in a couple field events. 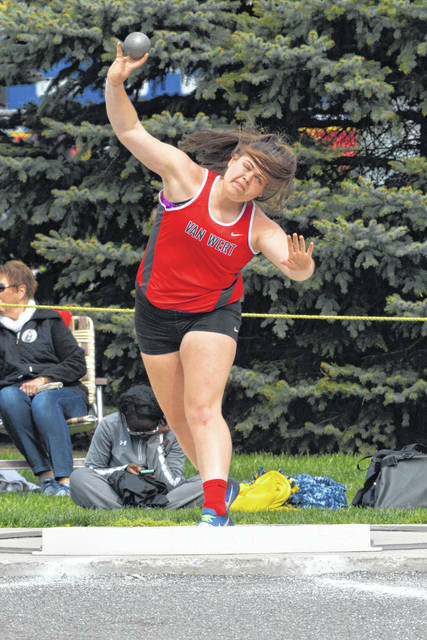 In the shot put, Van Wert finished one-two as Abby Jackson won with a mark of 37 feet, 9 ¾ inches. Teammate Tabatha Saam was second with a put of 36-4. In the long jump, Van Wert senior Megan Braun won with a mark of 18-5 ¼.
Braun also won the 400 meter run (58.14 seconds), and was on the 800-meter relay (third, 1:49.72) and 1,600 relay (first, 4:06.14). On the boys’ side, Celina’s Adrian Hurley was a workhorse, winning the 800 (1:59.14). He also competed in the 1,600 (third, 4:39.40), 3,200 relay (fifth, 8:40.07) and anchored the winning 1,600 relay (3:32.19). The 1,600 relay was the final event of the meet Friday. Wagner was overwhelmed at his boys’ performance this week. 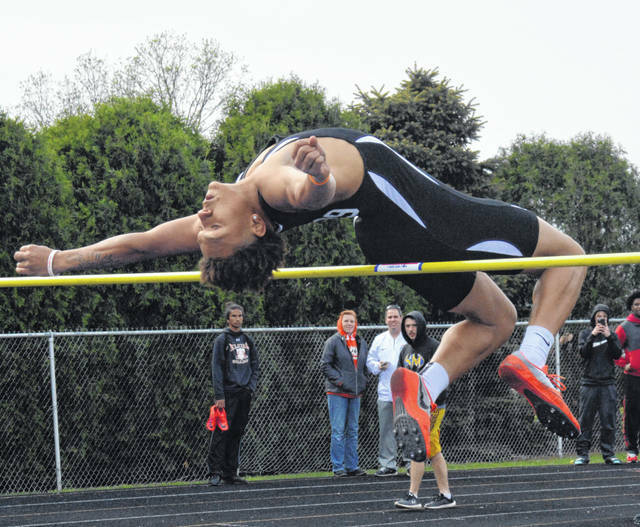 Elida senior Xavier Gilkey continued to dominate the hurdle events. Gilkey took first in the 110- (15.27) and 300-meter hurdles (40.42) Friday. The Defiance boys looked strong in the distance events Friday, taking both first and second in the 1,600 and 3,200. In the 1,600, it was Defiance’s Bryce Mendenhall winning in 4:29.62, while teammate Mhalicki Bronson was second in 4:35.51. In the 3,200, Bronson won in 9:45.73, while teammate Hayden Howerton was a close second (9:48.88). This entry was tagged bath, celina, Elida, kenton, ottawaglandorf, shawnee, stmarys, vanwert, Wapakoneta. Bookmark the permalink.